The Difference Between City Boys and Country Boys. By JANE ADDAMS, Sociologist, Chicago. When a city boy of twelve or fourteen, that age which we sometimes call the "BIG INJUN" age, the age when a boy wants to show off to his companions, wants to climb higher and run faster and do all sorts of remarkable things which will dazzle his companions, does try to run down the street, does try to throw a stone as far as he can, HE IMMEDIATELY GETS INTO TROUBLE WITH THE POLICE or law abiding citizens. The boy has this PERFECTLY NATURAL, NORMAL IMPULSE, but the only thing that he can do is to draw in, accept what you call his, say, "No, I cannot do that; I must stand still; I will get into trouble if I do that." Now, what happens when a boy does that a good deal? He GETS INTO THE HABIT. His muscles, his mind, his nervous system, begin to think that the thing to do when you want to do a remarkable thing is NOT TO DO IT; when you want to excel yourself don't do it. When he becomes a man, when he goes into the factory and some difficulty arises in his work, all the habits of his youth, the habits which were recorded in his muscles, in his nerves, in his mind, arise, and he does not overcome it; he does not make his exertions; HE STOPS HIS EXERTIONS AND LEANS BACK UPON HIS STREET CORNER, SO TO SPEAK. WHAT IS THE DIFFERENCE BETWEEN THIS BOY AND A BOY WHO COMES IN FROM THE COUNTRY, THE GOOD OLD FASHIONED SIMPLE AMERICAN THAT WE USED TO BE SO FOND OF? WE SAY THESE LATTER ARE THE BOYS WHO UP TO DATE HAVE MADE THEIR MARK MORE THAN ANY OTHER MEN IN AMERICA. WHAT HAS BEEN THE DIFFERENCE? MERELY BECAUSE THEY HAD THE CHANCE IN YOUTH TO OVERCOME THINGS, TO EXPRESS THEMSELVES IN PLAY AND ATHLETICS. City boys have been brought up on street idleness, have been brought up on the false excitement which the street offers. They have had NOTHING WHICH WAS NATURAL AND NORMAL from their youth. We may give these same boys athletic fields, SOMETHING WHICH WILL CALL UPON THEIR ENERGY, which will tax their powers, which will make them courageous and preserve their power of INITIATIVE, and then we will be able to see if we cannot pit our city boy against the old fashioned country boy, who seems to have carried off all the honors of the past generation. 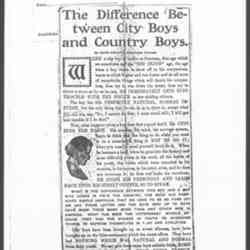 Jane Addams, "The Difference Between City Boys and Country Boys," Dallas Daily Times Herald, December 29, 1907, p. 4. 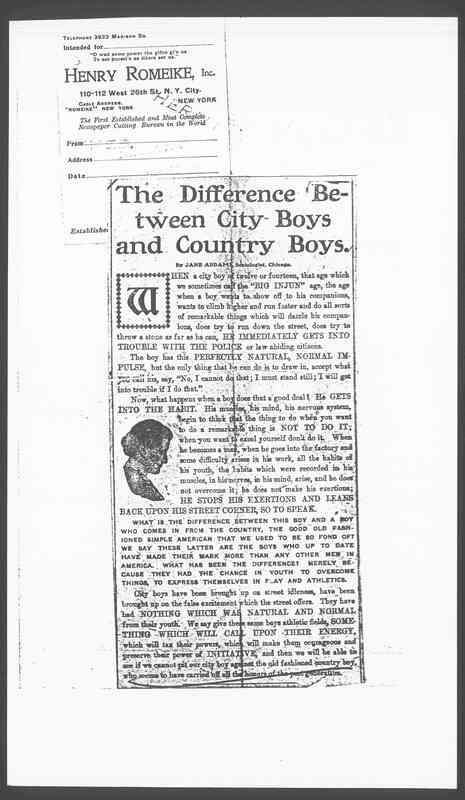 Addams, Jane, “The Difference Between City Boys and Country Boys, December 29, 1907,” Jane Addams Digital Edition, accessed April 23, 2019, https://digital.janeaddams.ramapo.edu/items/show/6002.